An augmentative communication approach, ‘baby signing’ teaches babies keyword signing that they can use to communicate before they can talk. The movement is increasingly popular with parents, but it is sparking academic, political and even moral debate. But just how do we assess anecdote, observation and experiment in order to determine whether the enthusiasm greeting baby signing is justified? There can be few things as frustrating for a parent as not knowing what their baby needs. Faced with a crying infant, what mum or dad hasn’t implored ‘What is it? Your nappy? You’re tired? You want milk?’ Now imagine that, with a clenched and unclenched fist, the baby could actually communicate to you that yes, milk is the order of the day. Sound great? Well, this ‘baby signing’ movement is currently sweeping the country. Parents are reading about the benefits of teaching ‘sign’ to their children and many are embracing this wholeheartedly. Numerous companies have been set up to promote and sell baby signing materials. All claim immense benefits to be had, including facilitating spoken language development, reducing tantrums and even increasing a child’s intelligence. But the movement is stirring up quite a storm. It is evoking academic dispute, political and even moral arguments. For example, is there sufficient research evidence to support baby sign (BS) for hearing children? Does the hearing population have the right to ‘hijack’ sign language? What about deaf babies, are their communication needs met adequately? These issues are getting ‘academic air-time’ and featured in a recent debate held by the Centre for Deafness, Cognition and Language (DCAL, University College London) as part of the ESRC Festival of Social Science. My personal view is that baby signing has a lot to offer to typically and atypically developing infants. There is something good here and we should not throw the proverbial baby out with the bath water. In addition, this dispute raises many important issues about how psychologists deal with implementing and applying knowledge for use by society. Why might baby signing be important? Of course, although it has grown as a coordinated and marketed movement, baby signing is not entirely new. Variants have been used by speech and language therapists for decades with children who have speech and/or cognitive impairments (e.g. Clibbens et al., 2002). And for good reason: it is widely recognised that communication is at the heart of child development, be it cognitive, social, emotional or behavioural (e.g. Vygotsky, 1978). In particular, clinicians and researchers have highlighted the association between communicative difficulties and behavioural problems. For example, Paul and Kellog (1997) found that children who were late talkers at age two years were more shy, aloof and less outgoing at age six. Similar poor social-emotional adjustment was found in late talking toddlers, along with higher reported parent-child dysfunction by mothers, in a study by Irwin et al. (2002). This link can be explained both by comorbidity and causal models. In the latter, difficulties communicating and the concomitant frustration, low self-esteem and lack of sense of self-efficacy that this brings, causes behavioural problems (Thorley, 2000). A downward spiral of effect can ensue with negative parenting (potentially caused by the child’s challenging behaviour) compounding the effect. a lack of provision to meet their communication needs. My opinion is that the extra support can often be valuable, especially if there are other risk factors involved, such as delayed language. While BS promoters claim various benefits verified in experimental research, there is in fact a dearth of actual research. I the discussion and clarification of concepts (Acredolo et al., 1999). I added practice with the symbolic function (Goodwyn et al., 2000). Analogous benefits are found in the learning disabilities literature. Using augmentative signing (e.g. BSL and Makaton) with children with learning disability such as Down’s syndrome provides advantages in communicative competence, language and speech development and even speech intelligibility (Buckley, 1999; Powell & Clibbens, 1994). A key issue here is ensuring that sufficient and appropriately designed research is available to back the claims made in relation to BS. Reviewing 17 studies of the impacts of BS on normally developing hearing children, Johnston et al. (2005) concluded that although benefits were reported in 13 of the studies, various methodological weaknesses leave the evidence unconfirmed. Certainly, research into the effects of BS needs better control groups, such as children who are involved in equally interesting and fun activities based around adult and child language interaction but not baby signing. Another issue is how we deal with anecdotal evidence. Many parents report benefits of BS and sing its praises, feeling that it has greatly enhanced their child’s ability to communicate and hence their own ability to respond appropriately to their child. These anecdotes are used to support and verify the BS approach, something that we scientists shy away from. Of course, anecdotal reports are not the stuff of science. Nevertheless, they can provide sparks of inspiration to researchers. The observations of child development noted by one particular father of 10 are testament to this. They were made by a dad with no training in developmental psychology some 130 years ago, and were on the whole remarkably accurate – see Darwin (1877)! I have heard many positive anecdotes from a range of professionals working in early-years communication, for example speech and language therapists and health visitors. What researchers interested in early communication development need to do is to pursue the topics that are being raised as BS continues to grow – for example, do all typically developing hearing babies respond positively to BS or are there important individual differences relating to, for example, different language acquisition styles? of deaf children acquiring sign language to hearing children acquiring BS, and yet this is what some BS promoters have done. For example, the ‘increased brain activity’ plug on www.babysigners.co.uk has a citation to a neuroimaging study of adult deaf native signers of American sign language (Bavelier et al., 1998) – not hearing children exposed to baby signs. Some of the major claims of benefits of BS relate to advancing language development. But is this barking up the wrong tree? BS effects may be more generic, involving efficacy in symbolic function and especially symbolic gestures. One deaf sign research study by Capirci et al. (1998) reports a case study of ‘Marco’, an Italian hearing child of deaf parents. He was raised bilingual with spoken Italian and Italian sign language. Marco had his vocabulary spurt in spoken Italian first and then in the manual modality. Overall his vocabulary was within normal range for monolingual Italian children of his age, so there was no evidence of a sign advantage. But Marco used more representational gestures (e.g. for ‘big’ and ‘swim’), in contrast to monolingual hearing infants who primarily use deictics (such as pointing). Marco also used combinations of two representational gestures at 20 months, and used far more cross-modal combinations (e.g. a gesture, apple, accompanied by a word, ‘me’) than the monolingual controls in the study. My own observations of an infant exposed to baby signing showed the same tendency to use representational gestures/signs/word combinations. This was the case even though the input was only keyword signing (suggesting that access to full sign language is not necessary to bring about these effects). Furthermore, many of this infant’s two-gesture combinations were supplementary in form (where both elements add information to the other, e.g. sad + me). Supplementary combinations of two representational gestures are never observed in typically developing normal hearing children (Capirci et al., 1996). Exposure to sign may therefore not boost all aspects of language acquisition, but may enhance representational gesture use – which is likely to have an important role in communicative function. In this vein, Volterra et al. (2006) conclude that enhanced gesture input for hearing children is a catalyst for gesture acquisition, and especially the use of representational form and hence symbolic communicative function. They add that this enhancement is short-lived (to between 12 and 15 months of age). I would argue that this timescale represents only a general norm. The enhancement and advantage is far more extended in the many toddlers who are not speaking until well after their second birthdays. There are a number of other related areas of research that would in their findings and conclusions lend support to BS as an approach to facilitate communication. Face-to-face communication signals such as gesture are a central part of human communication. Indeed Goldin-Meadow (1999) proposes that the imagistic and analogue gestures that accompany speech reflect thought and knowledge of the speaker/gesturer that is often not expressed in other more codified forms of communication, such as speech. If visual forms of communication are of central importance to typically developing hearing and speaking adults and children, they will be much more important if an individual does not have access to spoken language for communication e.g. preverbal infants. Indeed gestures seem closely linked to the development of spoken language, with deictic pointing correlated with first word onset (Bates et al., 1979). Goldin-Meadow (1999) proposes that gesture is a ‘way-station’ on the road to language over both ontogenetic and evolutionary time. Similarly Corballis (2002) proposes that hand gestures and spoken language are integrally linked in human evolution. He claims that language developed from and within gesture systems rather than from vocal calls. 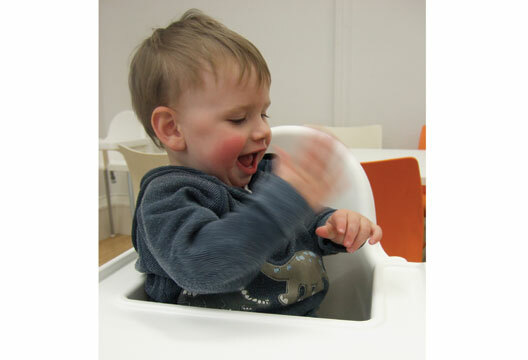 We see clear developments in the use of gesture in children as they develop and acquire language. For example, infants first use pointing to request (around 10–12 months) and then later (around 18 months) to comment on object and events. Infants use gesture plus word combinations to form two-item strings (e.g. give + point to a cup = ‘give cup’. The use of these two-item gesture/word strings is predictive of the development of two-word strings (Bates et al., 1979). Capirci et al. (1996) report that 16- to 20-month-old Italian babies produced many gesture + word combinations (mostly complementary where a single referent is singled out by a deictic gesture e.g. flowers + point to flowers). Combinations of two gestures were rare, and two representational gestures were never seen. This may be because babies are seldom exposed to representational gestures and probably never witness combinational sequences of representational gestures. Supplementary combinations increased between 16 and 20 months where each of the combined elements added information to the other (e.g. ‘all gone’ gesture + apple), but again these were primarily gesture-word combinations rather than gesture-gesture. In addition children didn’t produce two-word utterances until they had produced supplementary utterances (see also Butcher & Goldin-Meadow, 2000). As discussed earlier, in hearing infants taught key word signing, there is an extension of this pattern in that there are more gesture + gesture combinations before the occurrence of two-word utterances. Furthermore these gestures are more likely to be representational rather than just deictics in baby signers. The study of the impact of gesture or sign on language development in hearing infants is therefore extremely interesting and raises many issues relating to the evolutionary and ontogenetic development of language. In deaf children the plot thickens as they of course do not have full access to spoken language input. Goldin-Meadow (1999) states that deaf children born into hearing families are without an external language model as they cannot hear the spoken language around them and their parents cannot use sign language. She reports data showing that such children develop their own system of homesigns, gestures that stand for words. Furthermore, these are formed into ‘sentences’ with structure akin to the ergative structures of natural languages. For example, there was some evidence that, when produced (and these structures were infrequent in her dataset), transitive actors occurred in second position after the verb (e.g. ‘eat you apple’). I have also witnessed a similar second position placement of the subject by a hearing infant taught BS. Around his second birthday he spontaneously began stringing signs together although this was not ‘modelled’ to him by any adults. Furthermore, he could hear and therefore had full access (and comprehension) of spoken English and hence had a model of language in which this structure was never used. Yet his spontaneous ‘sign sentences’ often had the following structure that does not match what he would hear in spoken language: ‘SWIM BROTHER’; ‘EAT ME’; ‘SAD ME’. If this pattern was found to be reliable across more children it would of course be immensely relevant to questions about the role of environmental input in language acquisition. Baby sign is clearly a much impoverished sign input in comparison to full sign language (indeed many would argue baby sign is a misnomer and should be replaced by something like ‘enhanced gesture input’). In relation to this, just as there are special characteristics of child-directed speech (e.g. Singh et al., 2002), there are also special features of child-directed signing. When we look at deaf mothers of deaf infants we see that they use a number of strategies to facilitate communication with their children that involve simplification of their signing. Child-directed signing tends to be simpler, for example often lacking the facial expression markers of questions, and following a more linear subject-verb-object form in contrast to adult-directed signing (Kantor, 1983). Changes towards a more complex adult structure occur around two and a half to three years of age, probably reflecting the increasing linguistic skills of the child. Certainly it is of interest and relevance to issues of BS that even deaf, fluent signers simplify their signing input to very young children. In addition, Waxman and Spencer (1997) report that deaf mothers are more likely to use tactile signals (e.g. shoulder tapping) to get their infant’s attention before signing. Furthermore, the signs themselves tend to be produced rhythmically and to be enlarged and slowed. When deaf mothers wish to refer to an object they are more likely to move the object towards their own face in preparation for the signed message and, importantly, are more likely to wait for their child’s attention to shift before signing their message compared with signing hearing mothers, who often sign before the infant attends. The effect of parents being ‘deaf aware’ in this way on the development of deaf children is illustrated by Spencer (2004), who showed that deaf infants of hearing parents were behind in terms of vocabulary development (sign and words) compared with deaf babies of deaf parents, or hearing children of hearing parents. Whether this deficit for deaf babies of hearing parents is associated with poor signing per se or something else (e.g. poor attention management) is a very important issue especially in relation to BS and the training that should be given to hearing parents of deaf children. Parents of today are flooded with advice from government and health agencies, the media and scientists about how to raise their children. The BS movement is only one small part of this. Not all of this advice is based on solid scientific findings, and we live in hope that, on the whole, effects are more positive than negative. However, as with every new venture, there may be many as yet unforeseen effects of the BS movement. For example, do the benefits justify the parental investment of effort? Is this effort actually brought to balance by more effective parenting? The only way to steer this in the ‘right’ direction is by gaining a better scientific understanding of the effects of BS on both infants and parents. From my perspective it is unimportant whether BS brings about any type of ‘accelerated development’. Why would this be important, or indeed desirable, in normally developing children? What is crucial is that communication skills, interactional style, and the social/emotional environment are set in good stead for all infants, especially those ‘at risk’. For example, BS is an excellent preventive measure for infants who are ‘late talkers’. For me, there are three different levels of support for BS: first, there is indicative, if not evidentially strong, evidence from BS research for benefits; second, there is related evidence from deaf sign and hearing gesture/language research; third, there is compelling anecdotal support from families who have embraced the approach. From a researcher’s perspective BS provides a fantastic window into the ontogenetic as well as evolutionary development of language. It is certainly a field of research ripe for developing, if anyone is up for the challenge. Thanks to Dr Gary Morgan (Deafness Cognition and Language Research Centre, University College London) for providing comments from a sign language research perspective for this article. Acredolo, L.P., Goodwyn, S.W., Horobin, K. & Emmons, Y. (1999). The signs and sounds of early language development. In L. Balter & C. Tamis-LeMonda (Eds.) Child psychology (pp.116–139). New York: Psychology Press. Bates, E. Benigni, L., Bretherton, I., Camaioni, L. & Volterra, V. (1979). The emergence of symbols: Cognition and communication in infancy. New York: Academic Press. Bavelier, D., Corina, D.P. & Neville, N.J. (1998). Brain and language: A perspective from sign language. Neuron, 21, 275–278. Buckley, S. (1999). Improving the speech and language skills of children and teenagers with Down syndrome. Down Syndrome News and Update, 1, 3, 111–128. Butcher, C. & Goldin-Meadow, S. (2000). Gesture and the transition from one- to two-word speech. In D. McNeill (Ed.) Language and gesture (pp.235–257). Cambridge: Cambridge University Press. Capirci, O., Iverson, J.M., Pizzuto, E. & Volterra, V. (1996). Gestures and words during the transition to two-word speech. Journal of Child Language. 23, 645–673. Capirci, O., Montanari, S., & Volterra, V. (1998). Gestures, signs, and words in early language development. In M. Iverson & S. Goldin-Meadow (Eds.) The nature and function of gesture in children’s communication (pp.45–69). Rome: Italian National Council of Research, Institute of Psychology. Clibbens, J., Powell, G.G. & Atkinson, E. (2002). Strategies for achieving joint attention when signing to children with Down's syndrome. International Journal of Language and Communication Disorders, 37(3), 309–323. Corballis, M.C. (2002). From hand to mouth: The origins of language. Princeton, NJ: Princeton University Press. Darwin, C.R. (1877). Biographical sketch of an infant. Mind, 2, 285–294. Goldin-Meadow, S. (1999). The role of gesture in communication and thinking. Trends in Cognitive Science, 3, 419–429. Goodwyn, S., Acredolo, L. & Brown, C.A. (2000). Impact of symbolic gesturing on early language development. Journal of Nonverbal Behavior, 24, 81–103. Irwin, J.R., Carter, A. & Briggs-Gowan, M.J. (2002). The social-emotional development of ‘late-talking’ toddlers. Journal of the American Academy of Child and Adolescent Psychiatry, 41, 1324–1332. Johnston, J., Durieux-Smith, A. & Bloom, K. (2005). Teaching gestural signs to infants to advance child development. First Language, 25, 235–251. Kantor, R. (1983). Communicative interaction: Mother modification and child acquisition of American sign language. Sign Language Studies, 96, 233–282. Moore, B., Acredolo, L.P. & Goodwyn, S.W. (2001, April). Symbolic gesturing and joint attention. Paper presented at the Biennial Meetings of the Society for Research In Child Development, Minneapolis, MN. Paul, R. & Kellog, L. (1997). Temperament in late talkers. Journal of Child Psychology and Psychiatry, 38, 803–811. Powell, G. & Clibbens, J. (1994). Actions speak louder than words: Signing and speech intelligibility in adults with Down's syndrome. Down Syndrome Research and Practice, 2(3), 127–129. Siegel, L. (2006). The argument for a constitutional right to communication and language. Sign Language Studies, 6, 255–272. Singh, L., Morgan, J.L. & Best, C.T. (2002). Infants listening preferences. Baby talk or happy talk? Infancy, 3, 365–394. Spencer, P. (2004). Language at 12 and 18 months: Characteristics and accessibility of linguistic models. In K. Meadow-Orlans et al. (Eds.) The world of deaf infants (pp.147–167). New York: Oxford University Press. Thorley, G. (2000). Behavioural difficulties. In J. Law et al. (Eds.) Communication difficulties in childhood. Oxford: Radcliffe Medical Press. Volterra, V. Iverson, J.M. & Castrataro, M. (2006). The development of gesture in hearing and deaf children. In B. Schick et al. (Eds.) Sign language development. New York: Oxford University Press. and Deaf Education, 2, 104–114. ?